day, we've written a blog post about Thought Foundation's commitment to protecting our environment and our upcoming exhibition Thoughtful Planet 2. Check it out! On World Ocean’s day we’re thinking about plastics effect on our seas. Plastics devastating effect on our oceans has long been a concern for environmentalists. Blue Planet documentaries trended on twitter and flooded Facebook causing plastic boycotting and ocean environmentalism to rapidly infiltrate public consciousness. Is this the beginning of an effective renaissance of reusable products and recycling or simply a temporary phase soon to be forgotten in favour of ease and functionality? Here, at Thought Foundation environmentalism and ethical craftsmanship is a huge element of our ethos. Thought Foundation is a place where creative thought and play are nurtured. Where new skills are learned, and where you can eat, drink or buy things that enrich the experience and hopefully make your life better. 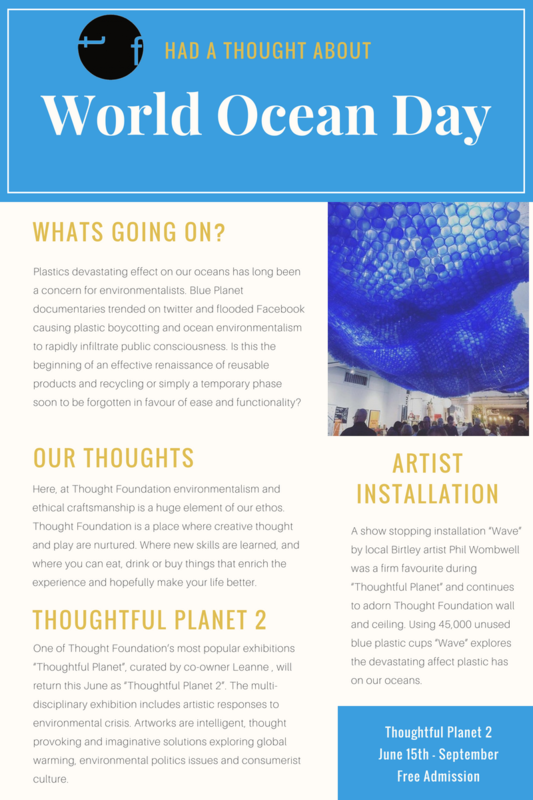 One of Thought Foundation’s most popular exhibitions “Thoughtful Planet”, curated by co-owner Leanne Pearse – Billinghurst, will return this June as “Thoughtful Planet 2”. The multi-disciplinary exhibition includes artistic responses to environmental crisis. Artworks are intelligent, thought provoking and imaginative solutions exploring global warming, environmental politics issues and consumerist culture. A show stopping installation “Wave” by local Birtley artist Phil Wombwell was a firm favourite during “Thoughtful Planet” and continues to adorn Thought Foundation wall and ceiling. Using 45,000 unused blue plastic cups “Wave” explores the devastating affect plastic has on our oceans. "A Mass of Sadness Invade Forty Six Thousand so Fleshly Consumed"
It has been a whole year since we opened our doors to the public, time flies when you are having fun! We received the keys for the former vehicle repair shop nearly 2 years briar and after the exciting, yet arduous task of renovating the space (on a creative shoestring budget) Thought Foundation was born. On the 11th April we celebrated a successful first year as a social enterprise. 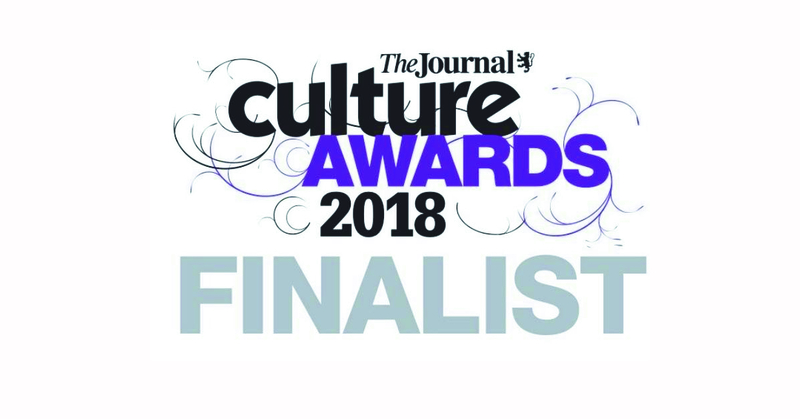 On the very same day we received the news that we have been nominated finalist for Newcomer of the Year for The Journal Culture Awards 2018. As you can imagine it was a cherry on the top of what has been a wonderful but equally challenging first year in business. Being nominated by visitors to Thought Foundation is particularly significant to us because it affirms that we have made an impact... which is what we set out to do from the beginning… open an arts and cultural space, where boundaries are pushed, ideas shared and thought is nurtured; to explore different subject matters, through exhibitions, conferences and events which help us unpick, decipher and showcase our subject matter in a multitude of ways. Our cafe is also going from strength to strength too, our customers really enjoy our wholesome, homemade food, including our infamous vegan carrot and walnut cake. Whilst our young humans respond well to our Imagination Station, a play area made from cardboard boxes, building blocks and their own mini gallery. We love to celebrate local in our shop at TF, we stock heaps of North East based designer/makers from creative ceramist Megan Randall to unique jeweler Lolla Mac, not forgetting the high quality artisan woodwork from Crescent 51. We have made a brilliant start with our education program also - which intend to develop this further during our second year. With proposed cuts to the arts in mainstream education, we see the arts as an essential ingredient to our lives - both as a taught subject and a conduit for self expression, with proven benefits to mental health and wellbeing. Keep up-to-date with all our events on all our social media streams @thoughtfoundation (Facebook and Instagram) @thoughtfound (Twitter).